A conversation with Michael Nyman, London, May 2017. 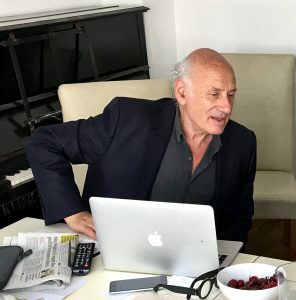 Michael Nyman at work, London, May 2018. Chris Meigh-Andrews: It seems both natural and inevitable that we should start our conversation by talking about the relationship between your music and your film work. The interconnections and interrelationships between these two activities are complex and unique, and I’d like to try to explore some of the key aspects of this. Many people will know you first and foremost as a composer and for your film scores, but are unaware of your film work up till now. Michael Nyman: How this all came about was that I had these cameras and I was constantly wandering around shooting things in Okinawa or Moscow, or wherever I was. I showed these films to Max Pugh and Marc Silver, whom I was working with at the time, and they were both fascinated by them and felt that my working process and my vision was interesting enough to start an editing process. So about ten years ago we began editing in Mexico City, which is what led to me buying a house there. Marc has since dropped by the wayside, but Max has stayed with me. CM-A: What is it, in particular about working with the moving image as opposed to composing music that engages you so much? MN: Nothing I do as a composer is remotely as exciting to me as finding and capturing- and especially editing, my films. I find it is the most creative thing that I do. In comparison to my film work, what I consider my “scribing work” as a composer is just tedious. In my work as a composer I don’t need any help except perhaps the mechanical process of editing and printing. I can’t do the editing of the films on my own. That aspect is a collaboration between me and Max. I find the ideas that I have just from handling the material goes way beyond anything I do as a composer. I think visual images are more interesting than musical images, even though it will be the musical images that I’ll be remembered for; I’ll never make films that people will say have changed their lives. CM-A: So in some important sense working with moving images feels more spontaneous and intuitive? MN: I’m totally self taught as a film-maker. Whereas when I write about my music I can say for example, here is a succession from Baroque music through Cage, Reich, etc, etc, or via a study of Romanian Folk music. I can explain how I’ve got to be where I am as a musician and therefore where I am as a composer (although of course there are some mysterious things that supersede all of that!). But as a film-maker I just literally go into the street with a camera. At times I’ve had larger cameras, but the whole concept of preparing yourself to make a film goes against the way I work. If I leave my house in Mexico City and walk 5 or 10 blocks something is likely to happen. But if I take a big camera and set myself up for the possibility of a film being “run before me”, (which is how I think of it), it just won’t happen. Whereas with this (very compact digital camera) in my pocket- its always there and I’m totally unself-conscious about it. CM-A: I understand there is a connection between Dziga Vertov’s “Man With a Movie Camera” (1929) and the development of your collaborative film work with Max, could you tell me more about that? MN: I’m ashamed to say that up until 2002 when I was commissioned by the BFI to compose a new soundtrack for Vertov’s “Man With a Movie Camera”, I had not seen the film. When Max saw Vertov’s film with my new soundtrack he had an idea that my films would work well with my Vertov score. Max decided that I was a kind of Vertovian film maker and he suggested that I had enough material to create when we now call “NYman with a Movie Camera” in which we would keep my soundtrack for Vertov’s film (which of course I now discovered was totally inappropriate to the way that Vertov thought about soundtracks- but that’s something else…) and Max analyzed and timed every shot and we meticulously replaced Vertov with Nyman. There are times when he kept the Vertov and sometimes we have put my shots side by side with the Vertov. MN: As a film-maker there are two parts of my brain- one is to go out and make a film that is independent in its own right. (Like “The Art of Fugue”.) The other approach is the kind of repository of “Man with a Movie Camera”. This is an ongoing process. I’m continuing to make new films, but also I am walking around with a repository of 10-12 Vertov subjects. I’m looking for sports, for cameramen, sleeping women, film editors, etc. So I shoot two things and sometimes there is an overlap. In “NYman with a Movie Camera”, you will see images from “Witness 1” and you’ll see images from “The Art of Fugue”, for example. There are also images that I’ve collected together which I consider to be dance images. Sometimes actual dance, sometime just movement, sometimes in a post-Vertov mechanical thing. So, there’s a sense in which I’m collecting “data”- images and sequences to put into “NYman with a Movie Camera”. We have many different edits, which keeps Max and I busy. Over the last four years we’ve turned this into an installation, with anything from 8-14 screens. CM-A: Can you give me an example of how you develop a new film or how the conditions that occur and give rise to a film, in more detail? Would it be possible to describe how a particular film evolved or developed? MN: For me, my classic film is “The Art of Fugue”. I left my house that Sunday morning five years ago with a sense of euphoria. It was the last day of the football season and QPR had stayed in the premier league. I left my house in jubilation and walked down the empty streets via my usual route and discovered that Plaza Luis Cabera was full of photographic activity! I made a single 28 minute shot of what was going on. I was like a kid in a toy shop- everywhere I looked there was something happening. In the original version that Max persuaded me to edit, there are moments during which I am looking for what to shoot next- and I’m happy with the way this looks because its the process that is important as much as the image. Max persuaded me that the 30 seconds during which I’m looking for the next shot should be included. So there are several versions, and of course if I’d tried to set up something like this, it would have cost a million dollars, and of course I would never have done it. So there’s this whole issue of the fact that the entire thing is there, perhaps people see it, or perhaps they don’t notice it. I not only see it, but I also decide to capture it. If I’d started in a different time or a different place, it would be a different film, so the first shot in my film is of a photographer making an image of a girl lying on the ground with her legs in the air with a fountain behind. There is a whole cast of characters and of course I didn’t know any of them, although some of them subsequently invited me into the shot, which is very Mexican. CM-A: I’d like to know more about the relationship between the music sound tracks and the images. For example, do you ever shoot a film with a specific piece of music in mind? MN: The situation with the music is always that we edit the film mute and then Max or I decide we need a soundtrack, and I go through my iTunes library and we select the best music to accompany it. The music always comes second. This immediate, instinctive decision is always correct and we never revise the decision. As a soundtrack composer who has sometimes laboured for months talking to directors about what music is suitable for their work- discussing, writing and rewriting, further discussion, leading to the final score (which is generally not used by the director in the way he agreed with the composer) or, if there is no agreement, leading to dismissal and rejection. Michael Nyman the composer finds working with Michael Nyman, the director, the easiest collaboration in the history of film! CM-A: There are several of your films that I‘ve seen where you have developed a soundtrack using the ambient sounds recorded during the filming; “Metal Bangers”, for example. I assuming the other sound you have mixed and overlaid with the percussive metal bashing is of chiming bells? MN: I shot that film in Isfahan (Iran). Later I was invited by Ars Electronica to make a piece with the bells in St Florian’s Cathedral, just outside Linz. I did something that I would never have done as a composer which was to put together a semi-composed piece and a found sound piece, and that’s what you hear on the film’s soundtrack. Something that I find exciting about being a film-maker is that I find I’m much more imaginative when working with a sound track as a film-maker than I am as a sound track composer. In “El Ritmo del Sismo” I decided quite randomly to use a saxophone quartet “Song for Tony”, a composition which is basically one fast movement and three slow movements. We edited the film’s four locations to the four movements. It was fine except that I was unhappy because the slow music was too slow and too sentimental- kind of grave, but not the correct gravity. I suggested to Max that he go onto Youtube and see how many recordings there were of this particular piece. We found there were six to eight and every one was different. I put together a soundtrack made up of different versions and different recordings of the same piece of music. I would never have done that just sitting down and asking “how can I make a soundtrack?” And no film-maker would have encouraged me to do it. I would never have suggested it to a film director such as Michael Winterbottom or Peter Greenaway. So there’s that sense in which the film-making involves me as a composer and a “re-composer”. CM-A:The cross-fertilization of sensibilities from one medium to the other makes me think of synesthesia. It seems to me that what is occurring is that you have this very deep understanding of musical structures and there’s something transferable or that relates to certain filmic structures. MN: Coming back to your other question about the idea of deliberately using a soundtrack. We have this dance piece. Part of it is real dance movement and some is mechanical dance movement (a la Vertov). I have a project that was commissioned by Ermenegildo Zegna, the Italian clothes manufacturers, for their 100th anniversary. They invited me to their factory up in the mountains, and I made some images of their machines which go very easily go into the Vertov film. I decided to use my composition “1-100”, originally written for Peter Greenaway’s film of the same title, but was never used. I made a long 10-15 min cross fade between the music and the machine sounds. That is something I would never have done . CM-A: The movement theme seems important, particularly in the films that I find particularly compelling, powerful or effective. Your fascination with the relationships between the photographic imagery (composition, framing, and subject) and the foregrounding of various kinds of movement within the film, gives me a sense of your work as a kind of “Expanded Photography”. Expanded in the sense that the photographic moment has been extended into the subject of the film. MN: When I’m asked what kind of films I make, I say: I’m a street video artist. What’s nice about these compact digital cameras is that you can switch back and forth between stills and moving images without batting an eyelid. The stills that I shoot are largely human being-free. It might be a certain kind of structure. Certainly in Mexico and Japan there’s a kind of accidental arrangement of textures or colours or whatever. There are very few portraits. Video is quite the opposite. It is the observation of activities and actions that I don’t participate in and that nobody controls. If we take the girls on the square (“The Art of the Fugue”) as a kind of model, they moved around in relation to each other and to the photographers, and the entire mis-en-scene was set up for me, but not set up for me, because nobody knew or had any consciousness of my engagement. What was also kind of interesting is that I’m filming the filming. CM-A: Yes, I was thinking about that aspect- the choreography of the film. The camera records the process of you making the film, You and your camera move around the pro-filmic event in order to capture this other movement. In “No Bull”, which is quite painterly in the way it seems to be at least partly about the colour of the costumes and the flat surface of the bull ring and the lines they paint onto the sand, for example, you also use a lot of repeat edits which seem to emphasize the movement. MN: I shot the entire bull fight, but when I sat down with Max to edit, I was more interested in the guys who shove around the sand. Nobody notices them. It had been raining and therefore they did something with the painting of the lines. There seem to be three processes: 1) There’s the replacement of images for the Vertov film- “No Bull” easily worked in that context; 2) There’s the sense of recording what I see, and 3); Archiving, which is an accidental procedure- this happened at that particular time. Basically the films are all to do with uncontrolled activity- the observation of events or occurrences that happen that are not designed or intended to be observed. CM-A: I’m thinking about the difference between what you do and photographic documentary for example. Consider Henri Cartier-Bresson’s notion of the so-called “decisive moment” for example, in your film “Tieman”. The protagonist doesn’t seem to notice you at all. Everyone else seems to be aware of you and your camera- the waitress, the guy behind the bar, but tieman seems to be oblivious. MN: At 7am I’m in Warsaw catching a train to Berlin. There’s this guy with a tie in his hand. He offers to sell me the tie and he’s drunk. If I’d bought the tie, there would be no film. I bought my breakfast, and whilst I was waiting for it, I noticed that he was trying to tie the tie. I got my camera out, switched it on and placed it on top of my glass. He wasn’t aware of what I was doing. So my camera becomes simply an acceptor of visual information. So gradually the cast of characters emerge. First of all there’s just me and him. Then theres’ the chef and the waitress, and then the guy who comes in and ties the tie for him. Again that is a situation that one would not have imagined, or arranged. So he ties the tie, and in the meantime what you see to the right and left of the frame is the Polish-German countryside flashing past. Obviously the connection is made: “What were those train tracks begin used for during the war?” It’s kind of my version of (Steve Reich’s) “Different Trains” (2000). I think the story behind the story is fascinating as it is. If you asked an actor to pretend to be a drunk- not being able to tie his tie on three different occasions, you’d get a series of fake results. But this is literally a kind of ethnography. I came up with an idea when I was reading Anette Michelson’s book on Dziga Vertov’s writings. When we use the camera to observe using slow motion, we see things we would otherwise be unable to see. I think this is what I do, initially unconsciously, now a bit more consciously, when I’m looking at these activities that happen in real time, although nobody really notices. My process of making the film is actually observing that event in slow motion. I relate these things, not to writing a piece of music, but to a Fluxus event. CM-A: Concerning the role of time and observation in your film work, I want to talk a little about how you are in effect composing both with, and in time. I mean in the sense that you are composing within the time-frame of the film; the way in which the film “frame” includes a temporal dimension. My particular angle is to do with how available technologies impact on the aesthetic dimension, so if you like, the ability to manipulate and emphasize time as a compositional element. Take for for example “Slow Walkers”, which I find quite poignant. MN: The first image that I shot is the first image that you see in the film. This was shot in a small village in Spain. One thing that (Peter) Greenaway and I had in common was a sense of making lists; To be serial in the best sense of the term and to make categories-even before I started on this pursuit of Vertov. Every time I saw somebody walking slowly, for whatever reason and in whatever location, I would film them. When we did our first edit of this work, I realised I had enough material to make the film. Basically it was purely visual- there was no sense of the sadness of it all, it was simply slowness as a phenomenon. CM-A: You often make a number of versions of your films, and some are being continually extended. Is this a central idea in your approach to working with the moving image? MN: The interesting thing in relation to the constant recycling of “NYman With a Movie Camera” is that its constantly being re-edited, because I’m constantly finding new material. I feel close as a composer to Vertov as a film-maker because he re-used his material. So for example, it’s possible to see the same shot in two or three different Vertov films. There are three or four versions of “Slow Walkers” and for example, there is a version of “Metal Bangers” that is 20-25 minutes because that was the length of cathedral bell chiming piece; so I looped the recording of the film of metal basing to fit the soundtrack. So the second time around it’s combined with a different part of the Bruckner piece. MN: Well there was a big change, which was the discovery of the archive. “War Work”. was a commission. I thought the easiest thing to do, since I’m a composer, is to write a war requiem. Since I knew this had already been done, and I decided to be a film-maker, using archive and music. It’s interesting- a complex layering thing. Max and I went to the military archive in Paris and we found the material that you see, which was selected on a economic basis. The footage- especially the footage of the damaged soldiers, is very cheap, because no film-maker would want to use it. The film builds itself up around this material. Having chosen these images it then led both intellectually and visually and in terms of movement, to the selection of another type of image. Again, it wasn’t me sitting down and writing a script and it wasn’t me wanting to make that film. But, a bit like the Vertov film, the more time I spent on it, the more information was accumulating. Writing music requires a certain type of intelligence. But except when I use a text or write an opera it doesn’t use any of my interests, any of my intelligence, and it doesn’t use any of my reference systems, other than musical ones. Occasionally I might refer to another piece of music. The objects that I re-compose or use in a piece of music are very much from within music. Whereas “War Work” in particular and the films in general enabled me to make these hesitant references to Dada and other things. For example, I’d always wanted to write an opera about David Bomberg and I was obsessed by those three Jewish painters living in the Whitechapel library- Bomberg, Mark Gertler and Issac Rosenberg. “War Work” enabled me in a hidden sort of way to feature them. I was in the situation of asking myself “Who is Michael Nyman?”. Michael Nyman is a composer of soundtracks. Everything is either up to the level, or down to the level of a soundtrack. I called the piece “War Work: Eight Songs and Film”, because I was so overwhelmed by the importance of these songs that they had suddenly overtaken me. There is the selection of the material, there’s the re-composing process which, as I say involves editing and then structuring a musical text, then the performance process, which kind of amplifies the emotional content of the music by about three hundred percent; I didn’t really realize that until we actually started playing them. That’s why I made the film and then reminded everyone that I was also a composer. After I completed “War Work” I said, if I die that’s how I want to be remembered. I feel I’ve written my greatest piece. Originally published as “Decisive Moments: A Conversation between Michael Nyman and Chris Meigh-Andrews” in Michael Nyman: Images Were Introduced , Fondazionne Elisabetta Sgarbi, Venaria Reale, Turin, 2017.